Same Place Garage Parking Every Time! 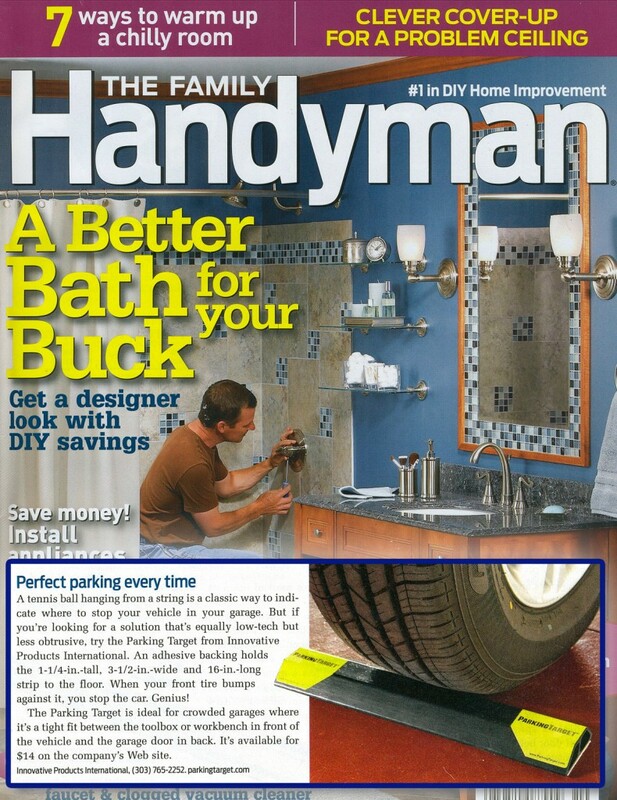 Heavy Duty ParkingTargets Will Probably Outlast Your Car! Makes parking easy – also a great gift! The Sure & Easy Way to Park a Hospital Bed and Avoid Damage to Walls & Equipment! DIMENSIONS: 16" x 3 3/8" x 1 1/8"
Click here now to order on Amazon! DIMENSIONS: 18" x 3 3/8" x 1 1/8"
DIMENSIONS: 24" x 3 3/8" x 1 1/8"
All ParkingTargets come with decals and tape attached. Replacement strips are great for moving your ParkingTarget and they're great for household projects. Keep these big strips around and you'll find dozens of uses. DIMENSIONS: 3" X 16"
Strong enough for the heaviest of fire trucks. FREE Mom & Dad Decals with every purchase. See how the ParkingTarget works! Watch it make the most of tight garages! Click for more about our new product! Click for more about our popular product! The story of ParkingTarget is simple. After moving into a home with a garage, I quickly realized I had an oil leak so I put a piece of cardboard on the garage floor but I kept missing it. I thought if I could find something that stuck to the garage floor as a reference point, I could not only park correctly, but in the same place every time. After searching for such an item I quickly realized it did not exist. So I set out to invent my own...and it worked. I could see the target, feel it as I drove over it or even if I just drove up to it, and I parked perfectly every time. ParkingTargets are made of Sustainable Commercial Plastic with Peel-&-Stick Tape attached to the bottom. We have our Standard Target (ipi-100), our longer HEAVY DUTY versions, which were originally designed for drive-thru fire houses, and a NEW line of Hospital Bed ParkingTargets – to keep the beds and other devices from hitting the walls. ParkingTargets are a simple way to solve a common problem. They are easy to install, they can be driven up to or driven over, so they are versatile a number of home and commercial uses. They work like a charm and are MADE in the U.S.A. So, if you’re like me and need a little help parking, give our Targets a try – you can’t miss. "Same Place Garage Parking Every Time!" It Sticks to the Garage Floor! Please see videos at the top of the page. Pry up on the ends with a shovel or use Wire/Dental Floss under the part to cut through the tape.